1975 O'Day Gold Medal Fleet — O'Day Mariner #1922 "Orion"
This advertisement was taken from a 23-page O'Day brochure in my own collection. 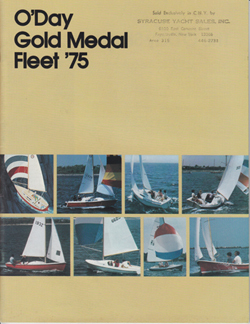 The catalog is divided into two sections: the "O'Day Gold Medal Cruising Fleet" and the "O'Day Gold Medal Day Sailing Fleet." The 1974 catalog is nearly identical to this one, although there is different text. 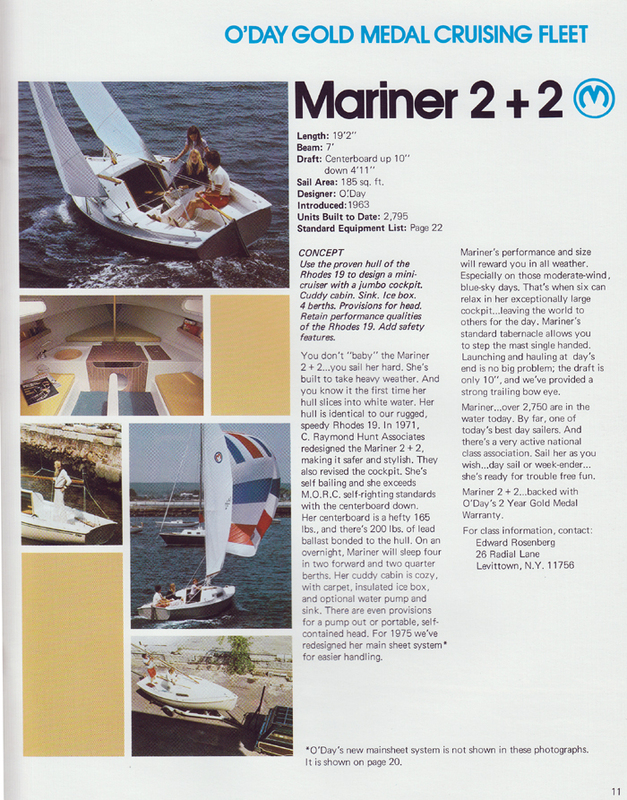 The "Cruising Fleet" section details the O'Day 25, 22, 20 and Mariner 2+2. The "Day Sailing Fleet" section details the Rhodes 19, Day Sailer II, Javelin and Widgeon. The first O'Day plant in the early 1960's was located on 168 Stevens Street in Fall River, Massachusetts, but they moved only a few years later to 848 Airport Road, a larger facility about ten minutes away from their old plant. This would be their main place of production until they finally went bankrupt in 1991. 168 Stevens Street is now A&E Metals Recycling, and 848 Airport Road is now New England Ropes, who bought the old facility shortly after O'Day closed its doors and moved in November of 1994.